Callum Sheedy kicked 22 points as Bristol returned to the Premiership for the first time since 2009 despite a 34-32 loss on the night against Doncaster. After winning 28-13 in the first leg, the hosts never hit top gear but held firm for a 60-47 aggregate victory. Doncaster always had the edge at Ashton Gate, with the in-form Will Hurrell and Ollie Stedman among five try-scorers. Having lost the play-off in the past two years, Bristol could not relax until James Phillips' 73rd-minute try. It was a topsy-turvy clash which eclipsed the first leg, with both Doncaster's Richard List and Bristol's Ben Mosses sent to the sin-bin in the second half. The sides traded penalties in a nervy start, but though the visitors had most of the territory, they could not make their dominance in the scrum count, with Declan Cusack missing a penalty. Bristol, meanwhile, did enough to keep their safety net intact, the inexperienced Sheedy finishing with a success rate of eight from eight with the boot. Hurrell grabbed his fourth try from four play-off games from the lineout to put Doncaster to within a point of their opponents on the night, but the hosts instantly replied as Will Cliff chased down a kick and dotted down to ensure a 16-10 lead at the break. List's yellow appeared to take the sting out of Doncaster, who finished 16 points behind Bristol in the regular season, but Paul Jarvis dotted down from a restart to keep them in the tie. Another two Doncaster tries followed, Tyson Lewis rolling over under pressure from Matthew Morgan and the powerful Stedman scoring while Bristol were down to 14 men. However, Sheedy was clinical and Bristol made the right decisions when it mattered to keep their noses in front, and the capacity crowd roared as Phillips scored a try to put the final beyond the Yorkshire side. A late Latu Makaafi try was no more than a consolation, but gave Doncaster the deserved win on the night. In the seven years that Bristol have been out of the Premiership they have almost relentlessly been knocking on the door of a return to the top flight. Andy Robinson's side have had to finish top of the second tier on five occasions to finally get their reward. Doncaster themselves only went up to the second tier in 2014 and second place is a marked improvement on their ninth-placed finish last season. 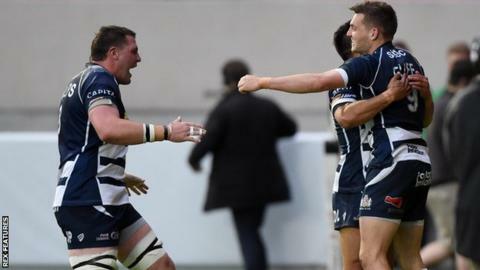 Bristol director of rugby Andy Robinson told BBC Radio 5 live: "It's been a huge team effort to get us over the line and I'm delighted now that we'll be in the Premiership next year. "Credit to Doncaster and the way they played the game - they threw the ball around, they attacked us with some width and they in the end won the game. "A special mention has got to be made to Callum Sheedy - he's come in and kicked fantastically well and had phenomenal performances for us." Doncaster wing Will Hurrell told Sky Sports: "We gave ourselves a tough job coming here with 15 points to gain - we gave it everything we had but it just wasn't enough on the day. "Fair play to Bristol, they're a hell of a team and they've shown it there. "I couldn't be more proud of the boys - we'll be coming back fighting next year." Bristol: Arscott, Wallace, Tovey, Mosses, Lemi, Sheedy, Cliff, O'Connell, McMillan, Perenise, Evans, Glynn, Mama, Lam, J. Phillips. Replacements: Brooker, Traynor, G. Cortes, Sorenson, Robinson, Roberts, Morgan. Doncaster: Jarvis, Bulumakau, M. Clark, Hurrell, Lewis, Cusack, Heaney, List, Hunter, Quigley, Challinor, Phelan, Shaw, Hills, Stedman. Replacements: Veikoso, Sproston, W. John, Young, Makaafi, Flockhart, Field.